42 ¾ x 32 ⅛ in. 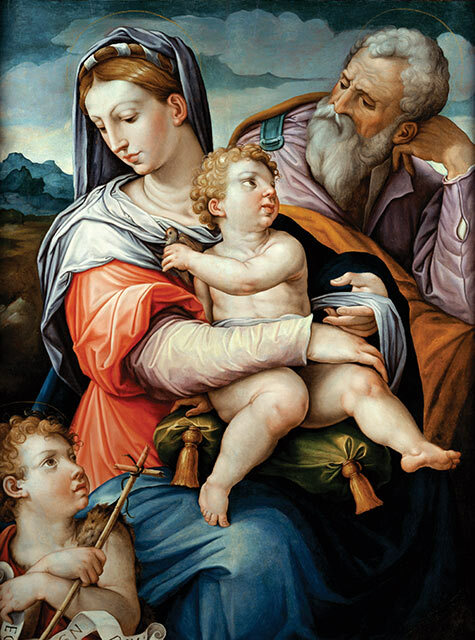 The intense, bright colors and exaggerations in scale of this asymmetrical composition demonstrate Giorgio Vasari’s close affiliation with the Mannerist style of painting. The Virgin Mary and St. Joseph are shown as caring parents of the Christ Child, who holds a goldfinch in his left hand. The bird is seen as a foreshadowing of the Crucifixion, as is the inscription on the banderole, Agnus Dei, or Lamb of God. St. John the Baptist is clad in the animal furs that foretell his preaching in the wilderness. In addition to his successful work as a painter, Giorgio Vasari achieved fame as the author of Lives of the Most Eminent Painters, Sculptors, and Architects (Florence, 1568), an important history of Italian Renaissance artists.